The place to be in 2018 is San Antonio. And Hotel Valencia Riverwalk is your place to make it a remarkable time. We're celebrating 300 years of pure San Antonio community, history, art, culture and curiosities. Since New Year's Eve, our city festivals, events and heritage have been on the world stage, and the party continues all year long. Come be a part of it all at Hotel Valencia Riverwalk. Visit our Calendar of Events to find out more about events. 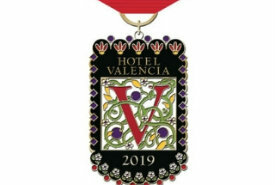 Hotel Valencia Riverwak is celebrating the City's Tricentennial all year long with a Special Hotel Package. Join us as we celebrate and enjoy all the entertainment, food and rich history that San Antonio is known for. The vibrant colors of San Antonio have emerged from 300 years of diverse culture, eclectic arts, brilliant innovations and culinary surprises. May 1718 was the beginning, and May 2018 is the continuation of performances, parties, events and exhibitions that look toward the future. Your stay at Hotel Valencia Riverwalk places you mere steps from the cypress-lined paved paths, arched stone bridges and lush landscape of our famed Riverwalk. And our knowledgeable staff knows all the hot spots and special events to guide you to make the most of your time in San Antonio. 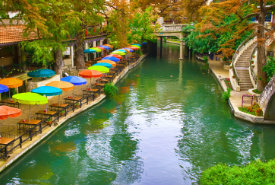 Come celebrate San Antonio’s 300 years in the making at Hotel Valencia Riverwalk. Explore the story of life in the missions during the 1700’s at San Antonio’s Missions National Park. As you tour each of the four missions, you’ll gaze at incredible architecture such as flying buttresses, carvings, quatrefoil patterns and famed stained-glass windows. Hear the tales of the people and the preservation of these historically-rich churches and grounds. You may even attend a Catholic mass as the parishes still hold regular services. Now you can extend your time at the missions by strolling the River Walk’s new Mission Reach. 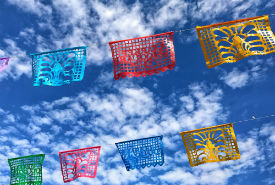 This eight-mile stretch is the place to enjoy recreational trails, picnic and seating areas, pedestrian bridges, pavilions and portals to four Spanish colonial missions—Concepción, San José, San Juan and Espada. Hotel Valencia Riverwalk’s staff stands by to help you arrange your time so you don’t miss the missions during your stay. Diversity, art, neighborhoods, history, and missions are just some pieces of the patchwork that make San Antonio on of the most unique cities in the world. It’s continually evolving communities stem from a host of immigrant influences and are expressed through architecture, colors, cuisine and festivals. Delve in to our culture and find character far beyond the Wild West. Find unbridled originality and curiosity. San Antonio museums showcase master works of art from Western, Asian and European cultures to Egyptian antiquities. But there is also a broad spectrum of historical exhibits promoting San Antonio’s heritage, ethnicity and social issues. And there’s no shortage of contemporary inspirations, innovations and avant-garde events. It’s certain that you will find a palate or two to your liking in San Antonio. San Antonio is a mecca for the arts. Performing arts to galleries, and art festivals to outdoor public sculptures – you’ll find a plethora of art throughout our city. Start in the Southtown Arts District, then head to King William Historical District and the Broadway Cultural Corridor. With more than 25 museums, over 40 performing arts stages and a continual flow of cultural arts festivals, it’s no wonder that San Antonio is within the top 25 cities for art in the United States. Come see for yourself. Tobin Center for the Performing Arts featuring the San Antonio Symphony, Ballet San Antonio, Opera, concerts and more!